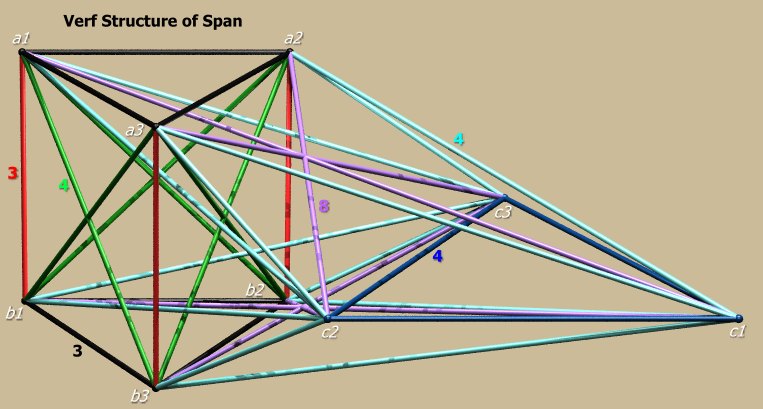 Above is the regiment map of the polyteron "span" - oxoo'x. Regiment maps have d+1 layers where d is the number of dimensions, so the 5-D example above has 6 layers representing regiments of dimensions 0 - 5. They list out each regiment class as a node and the connections link regiments one dimension apart. 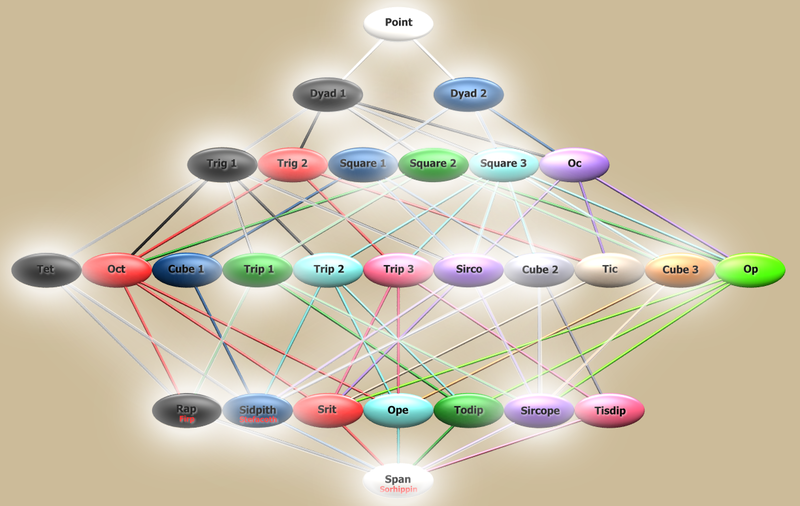 For example the rap regiment contains tets, octs, and trips (trip set 1) in which it links to them in the layer above it. Trip 1 belongs to the following regiments: rap, todip, and sircope which connect to it below. The top layer (point) represents the set of its vertices. There are two groups of edges, dyad 1 and 2, and several groups of faces, cells, and terons. While there is one peton on the bottom layer, the polyteron span itself. Selecting a member of the regiment activates regiment nodes and connections in the same way neurons fire up in the brain, I find this quite interesting - imagine if all of mathematical truth itself is connected this way, it would be the ultimate brain! Anyway, below shows which regiments in the span regiment map that are activated in one of its members - sorhippin. Sorhippin contains firps (from rap regiment), stefacoths (from sidpith regiment), and sircopes - so the span node (labelled sorhippin in red) connects to these three regiment nodes. 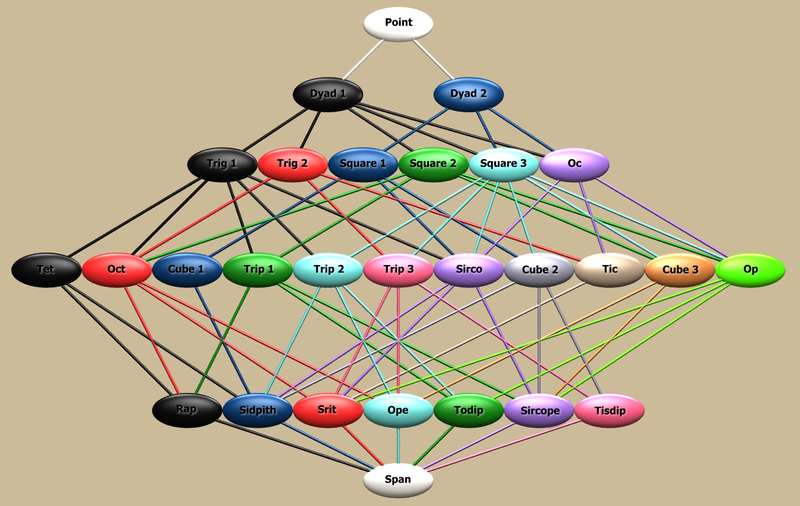 Firp contains tets and trips (set 1); stefacoth contains tets, sircoes, and cubes (set 2); and sircopes contain sircoes, trips (set 1), and cubes (sets 2 and 3). We can follow these connections up to the top layer, point (the vertices). Above is the verf structure of the span regiment. The vertices are labelled in white, they represent the dyads in the regiment map - black vertices represent dyad set 1 and blue vertices (c1, c2, and c3) represent dyad group 2. The edges represent the polygon sets in the regiment map with the same colors. For example the green edges (labelled with a green 4) represents squares (set 2). Below is a list of all the regiment classes with the following info: the number of times they meet at a vertex (verf count), number of times they show up in the entire regiment (class count), the crossing number, and a list of vertices showing where they are on the verf structure. The first three will be displayed in this format: 2/240/0 - this means that the verf count is 2, the class count is 240, and the crossing number is 0. The crossing number can best be described in this manner: Notice the green edges on the verf structure, they are not on the edges on the convex hull of the verf, instead they cross a face on the verf. Faces have one more dimension than an edge, so the crossing number of the green edges is 1. For the polytope span itself, this means that the square 2 class is not on the faces of the shell of the polytope (the shell can be thought of as the 'convex-verfed' hull), but crosses cells of the shell (oct shaped cells that is). If the crossing number of a p-dimensional element is 0, then it lands on a p-dimensional element on the shell. If the crossing number is k, then it crosses a 'p+k' dimensional element of the shell. Vertex lists will be described like follows: a123 - means vertices a1, a2, and a3; abc2 - means a2, b2, and c2; ab23 means a2, a3, b2, and b3; ab2c1 means a2, b2, and c1; and so on. A list of these will look like this: a123, b123 (for the tet class in this example) - there are two tets meeting in the verf structure, the first with vertices a123 and the second b123.